what other skin lesions associated with this condition? what is the mode of inheretance? this is adenoma sebaceum,isnt it? papular eruption on the centre of the face,likely adenoma sebaceum,I would like to ask about history of epilipsy and mental state. this is likey due to tuberous sclerosis. papular eruption ont eh nasolabia area resembling adenoma sebaceum. 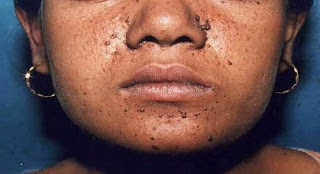 I would look for shagreen patches on the back, ash leaf macules(hypopigmented macules), periungal fibroma on the fingers or toes, cafe-au-leit spots. I would also enquire about family history of tuberous sclerosis, history of epilepsy, learning difficulty, dipstick her urine for protein and blood, measure her blood pressure for hypertension which could be secondary to chronic renal failure secondary to angiomyolipoma. The physical signs are consistent with tuberous sclerosis.